It feels like it’s been a while since I entered a challenge – I’ve been really busy and only been getting a chance to make cards for the design teams I’m on. Today I finally had a chance to make a card that I’m entering into three challenges – Inspired by Stamping Inspiration Challenge and Inspired by Stamping February Blog Hop – Bows – for this hand-dyed quadruple scrunchy bow. 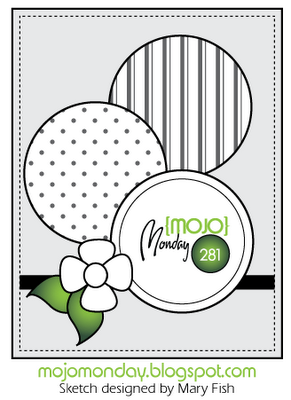 My card was made with this weeks Mojo Monday sketch – I love this unusual sketch and had fun working with the circles. I love your card. 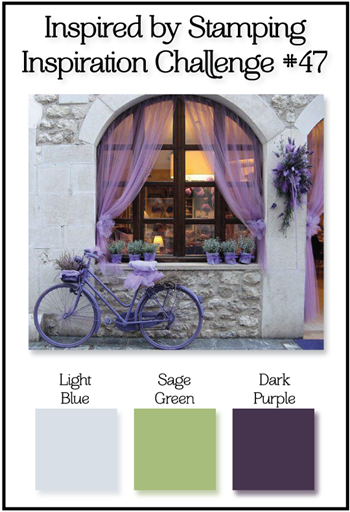 I struggle with purple even though I love the color, so your card has given me ideas as to how to pair it with another color. Very pretty. Purple! Woo hoo! We don’t use purple much in SU do we! Gorgeous paired with this Brocade Background, lovely! An absolutely stunning card in every way! So far for the Monday Mojo Challenge, I think your card is the best I’ve seen. When I first saw the sketch I was not happy with the circle thing. But, you have done this more justice and your card is beautiful. Thanks for sharing. So pretty! You bow is lovely and I really love the row of pearls. Thanks so much for joining us at IBS and for the Bow Hop! Gorgeous card. Love the purple and your pretty bow. Oh my, oh my, oh my…that is a stunning card! Gorgeous!!! 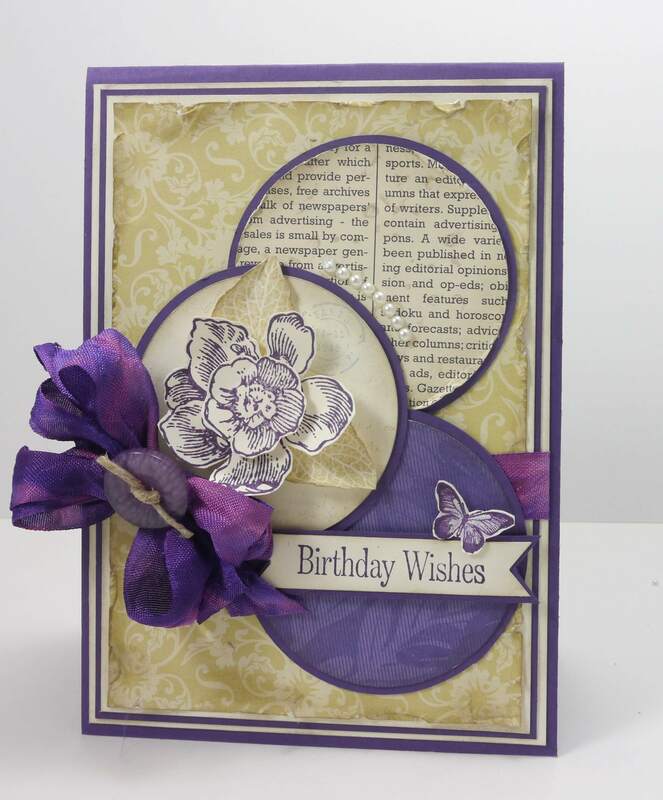 Really beautiful card,purple and cream looks so good together what a lovely way to set of the circles,bow is gorgeous. Oh this is breath taking!! Love the rich color of purple and the seam binding. Thanks for joining us at IBSIC this week. Very lovely, Narelle! I love that sketch, too. It’s a keeper! Narelle, I continue to follow your blog and enjoy your beautiful work. I have a question-hhere can I find the Brocade Background DSP? This is such a pretty card-as are all of your creations!